Is the word racecar a palindrome? These triangles are a reflection of each other. Select which line of reflection makes the statement true. Reflect DABC in the x-axis. Determine the coordinates of the image triangle. What are the coordinates for Point A in the image triangle? What are the coordinates for Point B in the image triangle? What are the coordinates for Point C in the image triangle? Reflect DABC in the y-axis. Determine the coordinates of the image triangle. What are the coordinates of Point A in the image triangle? 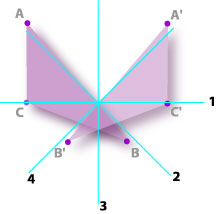 What are the coordinates of Point B in the image triangle? 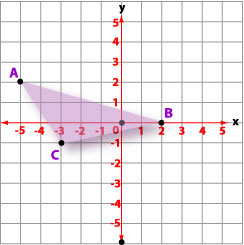 What are the coordinates of Point C in the image triangle?